Samsung and other brands had been riding the bandwagon and jokes around of bending issues of iPhone 6 and iPhone 6 Plus in very creative and interesting ways. The new smartphone handset models of Apple Inc. had been receiving various criticisms on how easily they could bend. 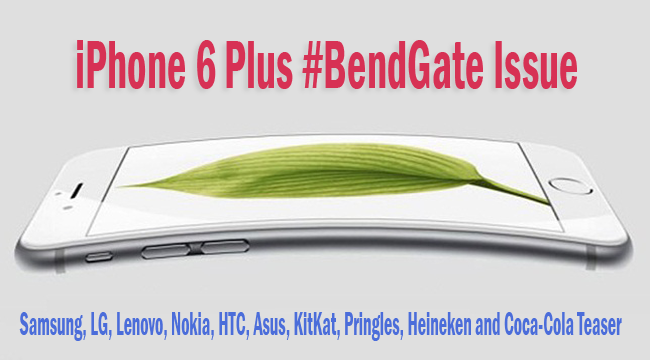 Not only major smartphone companies had not only used the issues to show how their phones surpass the durability of iPhone 6 Plus, but also some food and beverage companies had used the controversy that is now known as #bendgate to advertise their products. Samsung had prided over their over their sleek curved design that is not bent. The Galaxy Note Edge has a unique design with its screen folded over to one side that would give the user the ability to see notification while not getting in the way of watching movies. Meanwhile, LG USA Mobile had presented on Twitter their phones that are purposely made to flex and not bend. ASUS uses the bending issues of latest iPhones to boast about the durability of their ZenFone 6 that they say would not bend. Lenovo Yoga 2 Pro, however, is actually build to bend 360degrees on purpose. They had chosen to show people that bending is somehow underrated while Nokia took pride of its unbendable older handsets. HTC USA bravely admitted that they are also using aluminum, the same marterial as iPhone 6 Plus, but they were happy to include the fact that their case is done differently. When it comes to food, KitKat took the issue into the positive side as they remind people that the choco wafers coated with premium chocolates are built to actually break not bend, as their banner always say ‘Hava a break, Have a KitKat’. Pringles proved that not all bent products disappoint the consumers while Heineken sarcastically shares their sentiments over the bending issues. Coca-Cola was proud to be curved in the right places since its conception. Despite the disappointments of consumers, people still find a way to have positive outlook about it, and other companies prove that the disadvantage of another company is an advantage to their side.